Turkey is a fantastic country where East meets West. There are more Greek ruins here than they are in Greece, more Roman ruins than they are in Italy and there are grand Ottoman palaces. Long been a link between kingdoms, Turkey still maintains its cross-cultural appeal. No wonder, more and more couples are choosing Turkey as their wedding destination. Whether it is dream weddings in the dream city ISTANBUL or the romantic beach wedding at Bodrum, a Turkey wedding is going to offer you those magical moments which you will never forget. Wedding rules in Turkey change depending upon whether you are a Turkish or a foreigner, and also there are different rules for foreigners from different countries, and also if one of you are a foreigner and other is a Turk. But don’t be scared. Destination wedding in Turkey is a pretty simple affair. You have to approach the Governor’s office with your up-to-date passport (with minimum 6 months left on it), birth certificates and certificate of eligibility to marry (obtained from an official of your country’s agency). Upon producing these documents, you will be issued a license. Turkey is a secular country and only civil weddings are legally approved and a government official should act as an officiant in the wedding. You can conduct the ceremony wherever you want, provided it should not have any cultural or religious significance. Residency is not required, but it’s recommendable to arrive 3-4 days ahead so as to get the paperwork completed. The Turkish capital is a dream city, existing since 330 AD. It was the main city for the Romans, the Byzantines and the Ottomans; no wonder, it is full of a variety of sites and ruins that date back to the fourth century. If you base yourself at Sultanhamet, you will find four major city attractions within walking distance – the Byzantine Hagia Sophia, the Blue Mosque, Topkapi Palace and the Grand Bazaar. Take a romantic cruise tour up Bosphurus River and a lavish Turkish bath in one of the historic hammams. Beware, this is an affair for the shy (but why to be shy in each other’s company) – you will be scrubbed every inch of your body and you will get a new slant for your idea of being “clean”. Bodrum is a fabulous city with the Aegean Sea and Turquoise Coast. Known as Asia Minor by the Greeks in ancient times, the Aegean coast is an attraction for tourists since long. Bodrum is famous for its collection of posh hotels and restaurants. The Turquoise Coast lying further south along the Mediterranean is home to the best beaches of the country and is dotted with cute seaside towns having family-run inns. Don’t miss the charming experience of “blue cruise” a local name for a multi-day sailing tour on a time-honored wooden gullet. Cappadocia is a Central Anatolian region which is a home to the most surreal landscapes of Turkey, with ravines, cliffs and wavy, spiraled pinnacles, carved out from rocks. This is a great destination for outdoor adventures, particularly hiking, mountain biking and hot air ballooning. There are enchanting homes, monasteries and churches carved out from rocky hills. You can stay overnight in one of these “cave hotels”, an experience you can never forget. 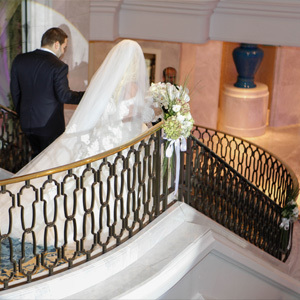 Crystal Concepts Weddings is a destination wedding planner in Turkey who provides an array of services carefully designed to meet the needs of couples and families looking forward to have a dream Turkey wedding. The fabulous photos in this article are their courtesy.